Our black girl calendar is a way for us to celebrate black girl magic in the comfort of your home. Each calendar is printed with fashion illustrations by French artist Doria-Adoukè. She wanted to pay tribute to black women all around the world. 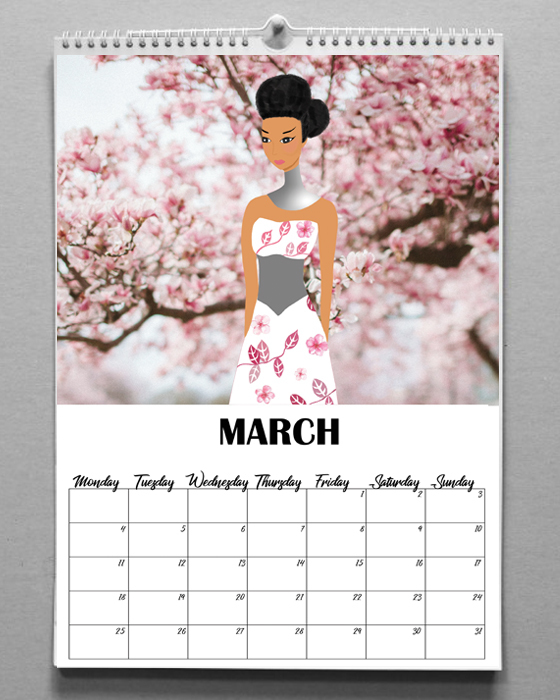 Our A3 wall calendar lets you look forward to every month with illustrations of black girls in fabulous outfits. But, it also has a specific goal: each illustration will either motivate you, make you travel, dream, or remember to take care of yourself. Now imagine yourself in your room under your duvet. 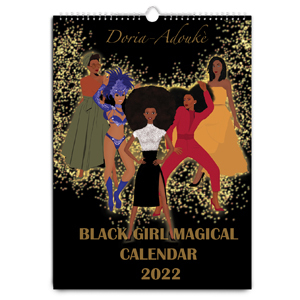 It’s snowing outside and you’re having a hot cup of tea while contemplating our black girl magic calendar. Sometimes, you just need these little moments to relax and escape. 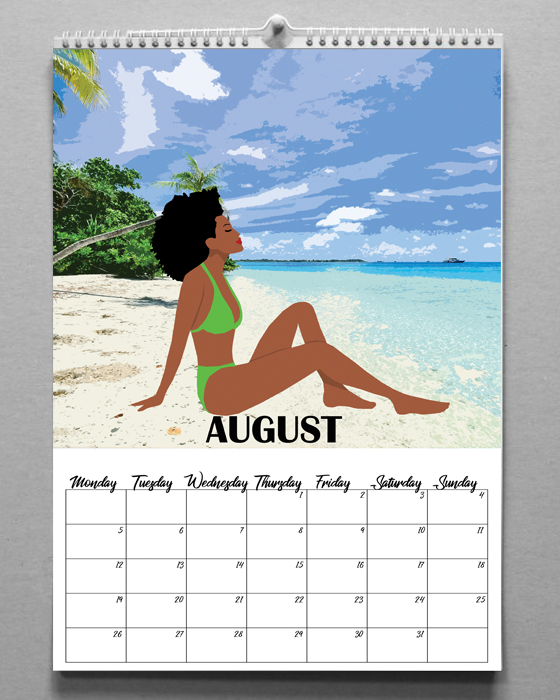 Our calendar shows a positive image of black women, they are beautiful, smart and slaying in a stunning outfit while nailing it at work or relaxing. At Black and Beautiful, we are all about women empowerment and we showed it with this calendar. This wall calendar is perfect to decorate your home or office. It is also a great gift idea. There is also enough place to write down your appointments. Desktop : Put in A3 frame and change monthly or you can also use clip board. Hang: you can hang it on your wall, or using a white or silver frame. So if you want to feel empowered and relaxed use our black girl magic calendar! We are doing a Black history month promotion -50% OFF using the coupon the code BHM50. Code expires: 4 April 2019. Discover our range of products celebrating black girl magic such as our mugs, our tote bags, our stylish notebooks and our black girl magic phone case. Shipping to US, Canada and Europe. I have just received by calendar today, it’s beautiful. Fast shipment. Love my calendar. Very fast delivery! I absolutely LOVE LOVE LOVE my calendar. I look forward to each month’s beautiful illustration to brighten up my home office. This calendar makes the perfect gift, or keep it for yourself!